Mindy was Elizabeth's very good friend up until about a year ago when there was a distinct break to their friendship. The hurt thrust them apart and has never mended. Mindy is the mother of two, Carrie and Angus. In the last year Angus has been more distant in his relationships with his family and Mindy worries about him. A fire has burned down John Phillip's house, it has grown and swept into the surrounding hills and bush. Who started the fire? About half way through I'd picked my person - but I was wrong! This was my first book by Catherine McKenzie but it won't be my last! Riveting hey ... sold, it's going on my list. Still haven't read anything by Catherine McKenzie even though she's been recommended many times. I actually have one of hers on my kindle, can't remember which one but it's older. Great review Kathryn! You've sold me on this book as well. :) Pinning it to my TBR. I am so intrigued by this book, and I haven't read anything by this author before. I'm glad to know you enjoyed it - great review! I am seeing this book in all kinds of places. I loved your thoughtful review. 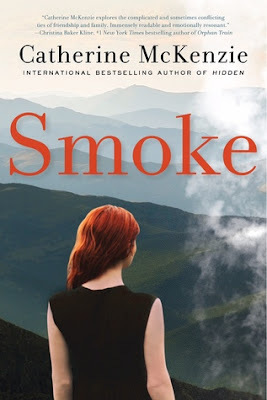 I am a big fan of her books, and I also loved Smoke. I like books that surprise me, and this one revealed just enough at just the right time. Great review! Great review Kathryn. I love the premise! I have this one on my list of TBR. After your wonderful review, I am going to move it closer to the top! This has my name written all over it! Hope to get to it soon. Oo this is the first time I've seen her. That really does sound good.